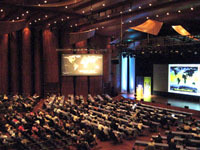 The European Space Agency is organising its second joint MERIS and (A)ATSR workshop, which will be hosted at ESA ESRIN in Frascati, Italy from 22 to 26 September 2008. Chelys will attend the event presenting the work done in the field of the satellite image processing: MOSRI, a Real Time Mosaics generation system. Earth observation satellite data have never been in more demand than today as missions have demonstrated their ability to enable better understanding and improved management of the Earth and its environment. ESA is meeting this demand by providing additional data, serving large science programmes, enlarging network stations and making more data available in near-real time. Responding to calls from ESA’s Principal Investigators (PI), the agency has released some 20 Announcement of Opportunity (AO) calls over the last decade that allow access to Earth observation (EO) data from ESA’s ERS-1, ERS-2, Envisat, Earth Explorers and Third Party Missions. As a result, more than 1500 scientific projects for research and applications development have been accepted and are receiving data free of charge.